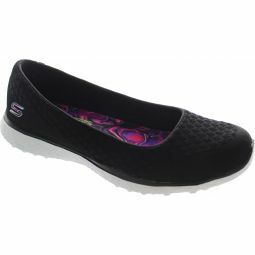 Textured soft fabric upper in a slip on sporty comfort walking skimmer sneaker with Burst material midsole. Air Cooled Memory Foam cushioned comfort insole. Burst Compound lower profile midsole with impact cushioning.